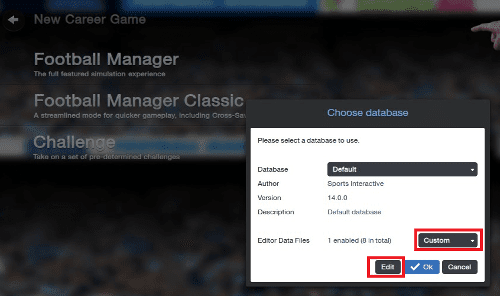 The Passion4FM Youth Database is back for Football Manager 2019! Discover the new potential FM19 Wonderkids here. Welcome to the first edition of our Football Manager 2015 Youth Database. As many of you might know, I’m particularly interested in scouting for new wonderkids and emerging talents both in real life and in Football Manager. Since I started passion4fm.com I’ve compiled shortlist of the best Football Manager wonderkids and written about the new emerging wonderkids who might feature in the official FM database of the future. Often I have been left with a list of promising talents and potential wonderkids who isn’t part of Football Manager, which is found watching numerous youth competitions and tournaments, such as the UEFA Youth League or the UEFA European Under-17 championship. Or I’ve discovered some great youth talents who is part of the official database, but who I feel haven’t the proper attributes, current ability or potential compared to other similar rated youngsters from real life in FM. Our Football Manager 2015 Youth database lets you import and discover new emerging wonderkids and talents which isn’t part of the official Football Manager 2015 database, or edited youngsters from the official database, but have improved massively since the FM15 database were locked prior to January transfer and data update of FM15.3 release. While the first file featured Norwegian wonderkid Martin Ødegaard published at FM15 release date, we have spend the time after 15.3 update to discover some potential Football Manager 2016 wonderkids. We will start by handing you all the Under-18 to Under-16 talents for FC Barcelona as a great expansion pack to try a La Masia youth development save in FM15. We will publish more youth database files in the coming weeks and months ahead of Football Manager 2016 release. Our Football Manager 2015 Youth Talents Database Update is created with all available information about each player; from full name to player positioning, from their idols to their preferred foot. With the huge amount of young talents added, for example within the Barcelona youth database, I’m sure there will be some unknown players to discover. Some of these players were also pretty much unknown for me in regard to potential ability and skills, so I have been forced to trust the little information found about them giving you the basic information in FM15. These youth talents doesn’t exist in the official SI database because of their young age or simply because they’ve been left out by the official Sports Interactive researcher due to lower reputation earlier this year when the official database was created…? We have also changed PA and CA for some of the current youth players from the official SI database to resemble the current real footballing world. The level of current ability (CA) is set according to the current team level the player is part of and doesn’t take into account player development or improvements these youngsters have taken since August 2014. This means that some of the youngest players might have a bit higher CA than they normally would have been given. You will need to start a new save in order to get access to nurture these young players into future wonderkids. Here you will be able to download all the different youth databases created wrapped in one megapack which you can unzip. The link will be updated with more and more files as soon as new youth databases have been published. At the moment you can enjoy the new talents of Barcelona, Chelsea, Manchester United plus some Norwegian and Swedish talents playing both abroad and in the national league of respective nations. For full list of talents and potential FM16 wonderkids added, we have released this pdf file. For the fans of Barcelona, for all Culés or Barcelonistas, here is the FM15 database update for you! Get access to all Barcelona youth players of La Masia until the age of 14, from Juvenile B to Cadete A. 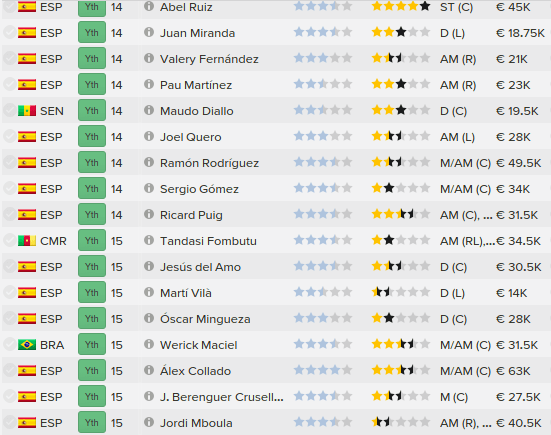 The Barcelona youth database update features both improvements to existing talents of Barcelona within the official FM15 database, as I have updated them to a more realistic level (subjective opinion only), as well as, and more importantly, added every player in the Juvenil A, Juvenil B and Cadete A level. I can not claim that this custom database is 100% realistic, but I do believe it will increase the excitement of playing with FC Barcelona in FM15 in terms of youth development. The Football Manager 2015 Barcelona Youth Database adds around 45+ new Barcelona talents under the age of 18 to your save. Here you will be able to enjoy promising talents such as Abel Ruiz (2000) the top scorer of the Cadete A of 2014-2015 and touted as the next Zlatan Ibrahimovic, or the potential Football Manager 2016 wonderkid goalkeeper Iñaki Peña (1999), who is labelled as the new Victor Valdes, amongst other Spanish Under-16 or Under-17 national players, such as the promising wingback ‘Chumi’, Alejandro Blanco Sánchez, the defensive midfielder Oriol Busquets or the promising winger Jordi Mboula Queralt, who can be compared to FM15 wonderkid Adama Traore. With over 40+ La Masia talents we have tried to provide you with the complete youth department of FC Barcelona until the age of 14. No matter the number of youth talents it will surely increase the amount of Spanish talents within Football Manager 2015 and make the first annual youth intake less important when managing Blaugrana. By publishing our exclusive FM15 Youth Talent Database consisting of new Barcelona talents it gives us the chance to introduce some of the new young wonderkids and emerging talents of Barcelona’s La Masia youth training academy. The Football Manager 2015 Barcelona Youth Database features 40+ Under-18 talents of the La Masia youth academy. The English Youth Talents extension pack features new talents under the age of 18 to the biggest clubs in England. We start off by handing you some potential Football Manager 2016 wonderkids from Arsenal, Liverpool, Chelsea, Manchester United and Man City. Here you’ll get some of the latest youth prospects transferred to their respective clubs in the last months plus changes to CA / PA for some of the talents who have excelled earning themselves a place in the English National squad. You can download single extension pack by clicking the clubs name. Reece Oxford DC 16.12.1998 England U17 (Capt). Since I’m of Norwegian origin it’s only natural to let you experience some of the new emerging talents and potential FM16 wonderkids of Norway and its neighboring countries. Since the transfer of Martin Ødegaard from Strømsgodset to Real Madrid I guess many of you are keen to see if there are other hidden talents of Norway, Sweden or Denmark who might follow in the footsteps of Martin Ødegaard this summer or within the next years. 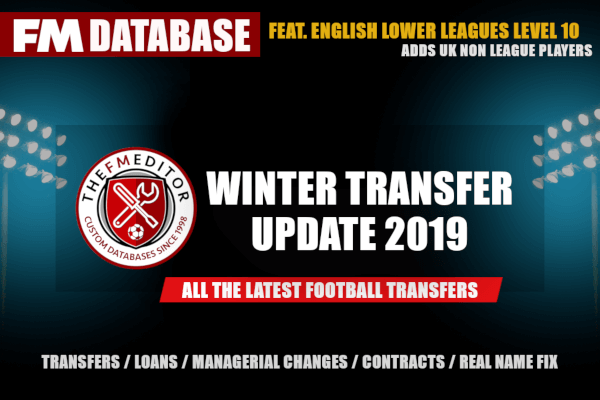 This database extension will let you experience some of the brightest talents in Scandinavia plus some decent youth which can make an impact to the top divisions within a season or three, as some of the players included are only 14 years old. Thanks to trondaage and Hjellix for providing information and feedback by chat. Also a big thanks to Adam Persson who took the time to suggest some new Swedish talents by comments. Thanks to ProHulst0s TV who have provided feedback and help with the Ajax Talents by using his in-depth knowledge of the AFC Ajax Academy. Subscribe to the ProHulst0s TV Youtube channel here. The information in the file is as accurate as possible featuring the information found. We can’t hide the fact that player attributes, CA and PA will be an subjective matter. If there should be some obvious errors, please correct them by sending us an email or using the comments field below. The photo, used in article image, “La Masia” is made available under Creative Commons Attribution-ShareAlike 2.0 Generic. Image courtesy of MARIA ROSA FERRE via Flickr. The photo, used in article image, “Harmeet Singh (Vålerenga Oslo)” is made available under Creative Commons Attribution-ShareAlike 3.0 Unported. Image courtesy of Steindy via Wikimedia Commons. We would appreciate if readers with in-depth knowledge of the youth players of La Masia or any other club provided can provide us with feedback, sources and valuable information in order to make it the most realistic and the best possible youth database ever created for Football Manager.